You know that feeling when you start getting a little sick — the feeling that something just isn’t quite right? Well, I have that right now. A slight fever crept in and my glands started to swell. 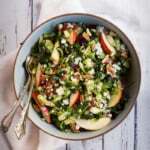 Immediately I could tell that my body needed rest and a healthy dose of anti-inflammatory, disease-fighting food. So of course, Thai green curry was on the dinner menu. And guess what? It works. I make this recipe and my healing chicken soup every single time I’m sick. The next day I wake up feeling a little better. Thus, this recipe was crowned the name ‘healing thai green curry’… with a few other descriptors in there too, I suppose. 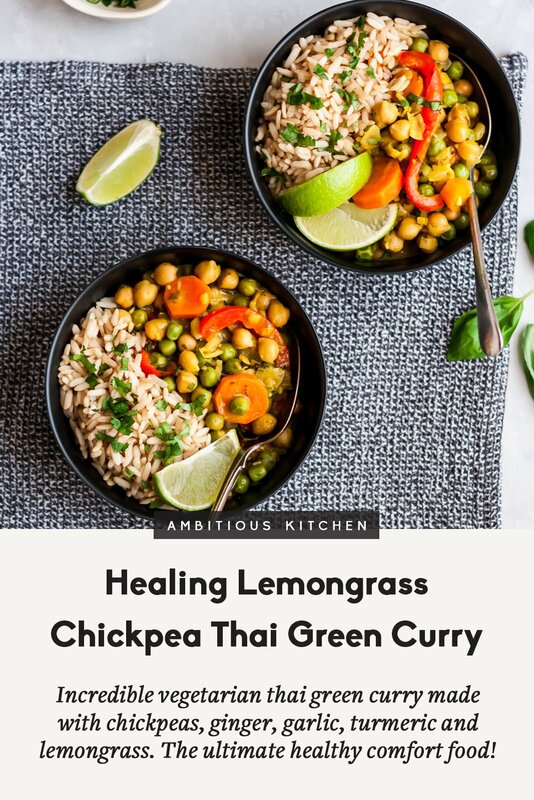 Before we get into just how amazing and incredible this recipe is, I want to let you know that 1) you don’t absolutely need to have lemongrass to make this dish fabulous and b) I need you to make this recipe immediately. I SAID IMMEDIATELY. OK? 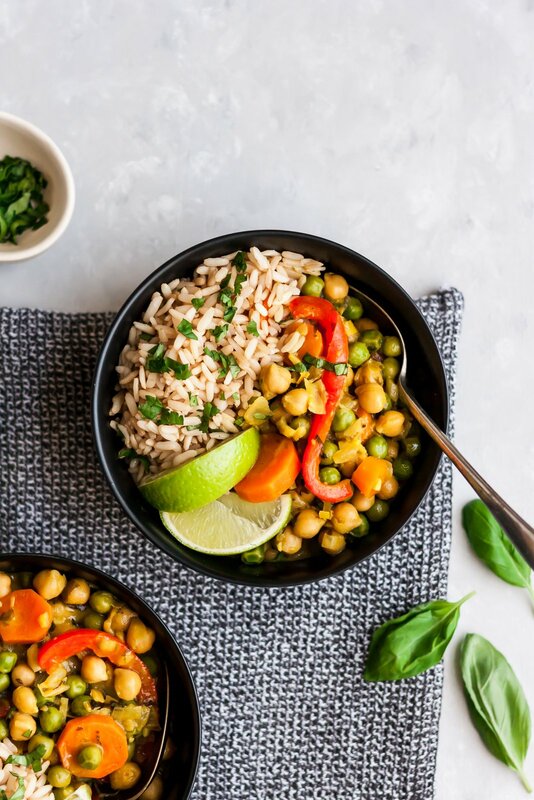 Besides being vegan and gluten free, this comforting Thai green curry is filled with the most delicious flavor combination I think I’ve ever tasted. I could proclaim my love for it over and over again, and if you trust me for recipes, then you know you need to make it too. Garlic: Studies have actually found it to be effective against fighting colds. It also has been known to fight infections naturally. I actually eat a clove raw when I feel sick. Tony thinks it’s weird because he’s the one who has to kiss me. Ginger: A true tummy tamer aka really good for when you have an upset stomach. Put it in your smoothie or put it in this curry. Lemongrass: The leaves of this plant are often used to make medicine. Its oil is often used in aromatherapy too. Check out how else lemongrass is commonly used here. I love the flavor it gives this curry and I promise you will too. Of course, you can always leave it out if it’s unavailable to you or if you don’t like it. Turmeric: Super trendy for the past year or two, but always delicious and a known anti-inflammatory spice. I love the brightness it adds to this dish. I recommend using fresh turmeric. Thai Green Curry Paste: You can get this at most grocery stores, but if they don’t have it — you can order it from Amazon. So what are you waiting for? It’s time to make this fabulous dish. I love to do it for meal prep and cook everything up on a Sunday for myself, then divide into containers. I’ve also included an easy recipe for a delicious toasted coconut brown rice that I think pairs well with the curry. I hope you all enjoy this dish as much as I do! It’s a new favorite of mine. If you make this recipe, be sure to rate the recipe and leave a comment below, or take a pic, upload it to Instagram and tag #ambitiouskitchen! xoxo love you guys. To make the brown rice: Add one cup of brown rice to a pan along with 1 teaspoon of coconut oil. Toast rice over medium heat for 5 minutes until fragrant. Next and 2 1/2 cups of water to a pot; bring to a boil, then reduce heat to low, cover and simmer for about 45 minutes. Heat oil in a large pot over medium high heat. Once oil is hot, add in garlic, green onion, lemongrass, carrots, fresh ginger, and diced fresh basil. Stir fry for about 5 minute until the onions begin to slightly brown. Next add in green curry paste and turmeric and stir for 30 seconds to release flavors. Add in coconut milk, vegetarian broth, chickpeas, soy sauce, lime juice, salt and red bell pepper. Stir well to combine. Bring to a boil, then reduce heat to low and simmer uncovered for about 20 minutes, or until carrots are tender. Right before serving, stir in frozen peas. Taste and adjust seasonings as necessary. 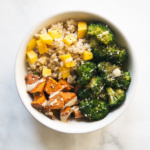 Serve over brown rice in a bowl and garnish with fresh cilantro, green onion and a dash of hot sauce if you like things spicy. Serves 4. *You can leave out the lemongrass and still get fabulous flavor! I know it can be difficult to find. I usually get mine from Whole Foods. If you'd like more protein in this dish, add another can of chickpeas, or if you aren't vegetarian/vegan, you can add 1/2 pound of chopped cooked chicken breast. 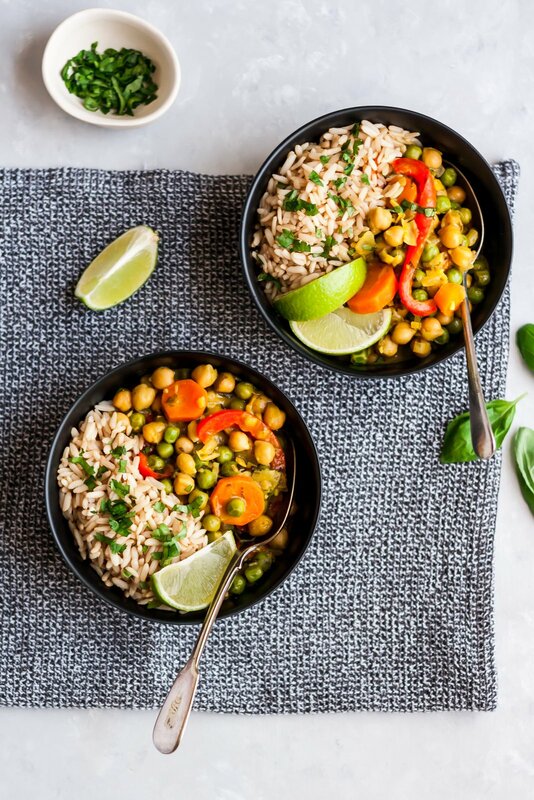 82 Responses to "Healing Lemongrass Chickpea Thai Green Curry with Toasted Coconut Brown Rice"
Wow, this looks amazing! Going on my menu next week for sure! This looks AMAZING! 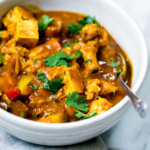 I love anything curry and turmeric! Can’t wait to make this!!! This looks so good! I’m just starting to experiment with making different types of curries – what brand of curry paste do you use? Can’t wait to try this! I may add cauliflower or broccoli too! THis was fantastic. All the spices blend together so well. I can’t believe that something so spicy and flavorful is good for you. Will definitely be making it again. Hi Melanie! That’s crazy coincidental. I’ve never purchased their nutrition plan but I’m glad that you are thinking about making this version! 🙂 Hope you love it! So yummy!! I just finished making a batch for my weekly meal prep and it is very delicious! I followed the recipe exactly (except I didn’t add peas), then at the end I wanted a thicker sauce so I took about 1 tablespoon of flour, mixed it up on the side with the sauce from the dish, and added it to the whole dish. I also added some left over slow cooker chicken breasts I had in the fridge. Thank you for this recipe! I ran into this recipe this morning and HAD to get to the grocery store to get the stuff to make it. I LOVE this! I can’t wait to have this for my lunches this week and actually be excited for lunch! This looks great. Excited to make it! Will you please clarify these instructions? When should the rice be added to the pot? Hi Sam, the rice should be toasted in the same pan or pot that you put the water in. I made the recipe and I loved it!! Just… my husband didn’t ! I used red rice from the Camargue (France) : delicious!! I loved this! I didn’t have lemongrass and didn’t toast the rice. I added hot sauce and some peanuts on top. I cut up all my ingredients first, and measured all of the spices, so I was ready to go. It was so easy. A must try in my book! This tastes incredible, the flavors are amazing! I used snap peapods instead of the regular peas, and rice noodles in place of the rice. I’ll definitely make this again. The above was supposed to be a 5 star rating! This is so fabulous and really easy. A great way to get your veggies in! Made this today without lemongrass and added extra turmeric. Used quinoa instead of brown rice. It was excellent. Thank you for the recipe. So glad you enjoyed this recipe. It’s honestly one of my favorites! I made this last night for dinner (omitting the lemongrass because I was too lazy to deal) and using red onion because it’s what I had in the pantry. It was so good and my family raved. I used basmati rice because, again, it’s what i have and my daughter prefers it. Will definitely make it again! This is now one of my “go-to” recipes for meal prepping – my husband and I LOVE it! Thanks for sharing! My first Ambitious Kitchen meal – overall very good and went well with a coconut lime rice recipe I use. This will definitely be a regular recipe for me! I used curry powder because I accidentally forgot the paste at the grocery store, but it still worked out. My only thought was the lemongrass tasted a little woody, even though I used only the inner stalk. Any thoughts on improving this? This was super yummy and I hope it has the same magical healing powers for me! A note for those looking for lemongrass – I couldn’t find any fresh at my grocery store, but found it in the produce section in a tube, like the ones you can buy garlic, ginger, cilantro, etc. I subbed one teaspoon per fresh stalk and that seemed to work fine. I also added about 2 handfuls of fresh spinach and 1 cup of frozen green beans with the peas and cooked just long enough to let the spinach wilt a little bit. Yum! Awesome. Thanks for the tip, Erika! This is delicious! My friend cooked it for a supper party last night and I can’t stop thinking about it – I’d have it again for breakfast it was so good! Friend added prawns – awesome addition. Must go – off to the shops to get the ingredients 😉 Thank you for sharing such a brilliant recipe. I’ve signed up to your email list. Can’t wait to try other recipes! Just made this last night and wow! New favorite! We subbed the chickpea for chicken, because my husband isn’t a fan of chickpeas. He said this could easily be something you ordered in a nice Thai restaurant. Can’t wait to make this again! Amazing! Yes it’s perfect for swapping in chicken – so glad you both enjoyed. This recipe is AMAZING!! I’ve been vegan for about 5 weeks and this is BY FAR the tastiest meal I’ve eaten to date. I packed it in my lunch today and could barely wait to eat it!! I might just make this recipe weekly! I’m so glad you enjoyed this one! It’s definitely one of my favorites (all year long). Enjoy! Forgot to rate the recipe in my previous comment…obviously 5 stars! Would give it 10 if I could! 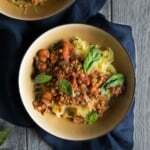 Tried this recipe a couple of days ago and we know this will be a family favourite for vegetarian nights. My supermarket was out of lemongrass but the green curry paste alone carried the dish just fine we thought. Amazing! This is one of my favorite vegetarian meals 🙂 and if you can’t find lemongrass that’s totally fine! Next time I’m making a double, possibly triple batch. I LOVE IT. This recipe calls for everything I love- chopping, fresh, flavorful, like every ingredient screams everything that makes me happy! YAYE! oh, I forgot about the rice tho…next time! Thanks for yet another amazing recipe! I’m so happy to hear that, Denise! Tons of fresh flavors in here 🙂 Enjoy! I happen to have red curry paste, I’m assuming that would work fine? The flavor will just be a bit different, but it should work fine! This was delicious! I couldn’t believe how quickly it came together and how flavorful it was. Easily could have ordered it from a restaurant. Thanks Monique for always making it look so easy. YES this one makes me feel like I’m ordering takeout (but better!) So glad you loved it! Second time making this. So nice! Thanks. Monique, this is delicious! 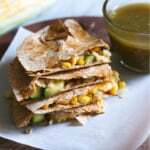 Love your flavorful recipes! My Thai Ktichen green curry paste was not spicy, and I did not use lemongrass. I used the listed veggies, but a lot of different veggies would be good in this. This is a keeper! 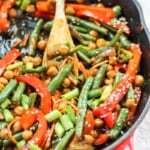 Is green curry paste spicy/hot? Really delicious and very simple and quick dish to make. Thank you for sharing! This was SO delicious. Thank you for the awesome recipe! I am looking forward to trying this out. Not waiting until I get a cold though! It’s delicious either way 🙂 Enjoy! All the flavors in this, yum!! I love its colors making it look so yummy!! I cannot print out your recipes. Does anyone else have the same problem? Hi Joyce! When you click the pink “print” button underneath the nutrition information it should pull up a new tab that you can print. Let me know if you have any trouble with that! You came to the right place! Curry is my fav. Hope you love this one! Made this last week. Subbed broccoli for red peppers and instead of chopping the lemongrass, I simmered the whole stalk in the sauce and removed before serving. Ate it over quinoa. Amazing for both dinner and leftovers for lunch the next day! 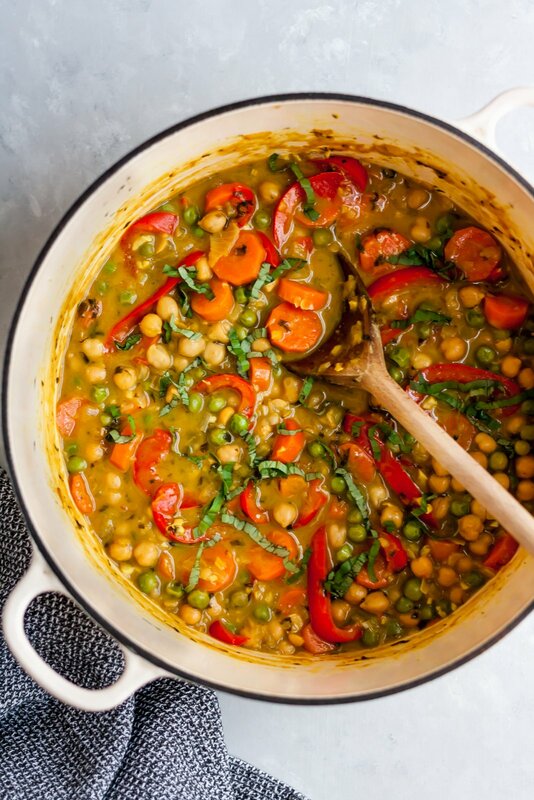 Perfect – this is delicious with quinoa! Whoa! This recipe is delicious! Had it for dinner and finished the rest today! I’ve never cooked with lemongrass and for sure it a nice flavor component of this dish.